Phoenix Sky Harbor International Airport recently welcomed Condor Airlines, which will operate the route between Sky Harbor and Frankfurt Airport twice a week through September. The flight will be served by a Boeing 767-300ER with more than 250 seats. Each passenger onboard will receive complimentary checked baggage, beverages, meals and in-flight entertainment. Travelers wishing to connect elsewhere will find that the flight offers a convenient and time-effective way to get to Europe and beyond. Royal Palms Resort, which combines the sophistication of a storied Mediterranean villa with the intimacy of a secluded retreat, is offering not-to-be-missed summer deals. 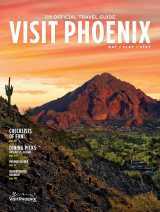 The Arizona Residents Offer starts from $179 per night. If guests stay one or 2 nights, they receive 15 percent off, and if they stay three or more nights, they receive 25 percent off. Must show valid Arizona driver’s license upon check in, and the booking codes are AZRES (for 1 or 2 nights) and AZRES1 (for 3 or more nights). The Royal Summer Retreat starts from $229 per night and includes $50 T. Cook’s dinner credit, resort fee and parking (over $100 value). It requires a two-night minimum length of stay, and the booking code is RPSUM. The summer deals are available through September 20. Unwind and dine with summer packages at the Hermosa Inn, which was ranked the #1 Hotel in the Southwest & West in Condé Nast Traveler’s 2017 Readers’ Choice Awards. The Summer in Paradise Getaway includes rates starting from $149 (plus tax and resort fee of $30), valet parking, overnight accommodations, two drink tickets upon arrival per room, $25 daily food and beverage credit, daily poolside treats, upgrade upon arrival (based on availability) and early check in/late check out (based on availability). The package is available through September 30. Vacationers in need of delicious dining will enjoy LON’S $49 Three-Course Summer Prix-Fixe Menu, created by Executive Chef Jeremy Pacheco. The menu will be available through September 16. Beat the heat through August 30 at the Sheraton Grand at Wild Horse Pass. Make the most of summer holiday waterpark weekends with large scale slip and slides, multiple inflatable water slides, a dunk take, family-friendly concession stands and more. For parents whose ultimate vacation includes just a little quiet time, find your way to luxurious pampering at our Four-Star Aji Spa or on the links at nearby Troon-managed Whirlwind Golf Club while your children enjoy our Adventure Club Camp. The resort is also offering a variety of staycation packages if you book between through August 30. The Moxy Phoenix Tempe Hotel is introducing its new spring and summer activities schedule. The programs will take place in the plug-and-play Moxy living rooms, which serve as the social hub of the hotel, offering communal tables and flexible seating along with a bevy of game tables. Some happenings will take place at the lively pool area - replete with private, shaded cabanas - and, the bar, which is the center of attention at Moxy Tempe, acting as the check-in counter while also serving up cocktails, well-sourced wines and local beers, grab-and-go bites and handcrafted coffee at all hours. Beyond the programming, Insta-worthy experiences abound through innovative hotel features from the Moxy Digital Guestbook to a one-of-a-kind vending machine, offering a playful coterie of items including selfie sticks, fidget spinners and Kylie lip gloss. Activities include themed movie Mondays featuring $7 drink specials, Taco Tuesdays from 4 p.m. -7 p.m. with $5 margaritas and all-you-can-eat chips and salsa, Wednesday’s Live & Local showcasing the area’s emerging talent, Blacklight Bingo on Thursdays from 8 p.m.-10 p.m., Karaoke on Fridays from 7p.m. -10 p.m., Saturday Game Days and Sunday Funday from 9 a.m. to 1 p.m.
As things begin to warm up for summer, The Wigwam welcomes families near and far to elevate their getaway to the Southwestern oasis with the Summer ‘Scapes package. The package offers a $50 resort credit for each night stayed to be used towards dining, or one of the three expansive golf courses. The package is valid through September 30th with rates starting at $139 from Sunday – Thursday and $159 Friday – Saturday. In addition to the package, The Wigwam offers no shortage of family fun with the Warren Schutte Player’s Academy offering guests the chance to perfect their swing to Kid’s Summer Programming, offering everything from raft races to a Wildlife World Zoo to keep the kids smiling while adults are free to enjoy The Wigwam’s Wine Dinner Series. The resort also boasts a world-class spa, bocce and tennis courts, an enhanced golf club with 54 holes of championship golf, and three expansive swimming pools, including a Tower Pool with a 25-foot tower with two twisting water slides, making it the perfect summer retreat offering something for all travelers. It&apos;s all about first impressions- and the Musical Instrument Museum is doing it right. Now when guests visit the museum, they will be welcomed by the hard-to-miss eleven-foot totem pole and large box drum on display at the Northwest Coast and Plateau exhibit. Commissioned from master carvers Calvin Hunt and John Livingston, this Kwakwaka’wakw totem pole and box drum set include family crests in the form of supernatural and animal beings that come to life through music, dance, and song. Both objects illustrate the central role of music in Native American ceremonial settings. Observe the lives of 13-year-olds throughout America as the Phoenix Art Museum presents To Be Thirteen: Photographs and Videos by Betsy Schneider. The portraits illustrate a heightened tension between the commonalities and differences among the teenagers, demonstrating how distinctly the age of 13 can appear on different people, while highlighting the similarities that every young person experiences as they transition from childhood to adolescence. The exhibition will be on display in the Norton Family Photography Gallery at the museum through October 14. Swap the iPad for a drawing pad and learn from the principles of America&apos;s greatest architect, Frank Lloyd Wright, at his historic, 80-year-old winter home, Taliesin West. Combining creativity with academic relevance, the Frank Lloyd Wright Foundation’s innovative Summer Art and Architecture Camps give students the opportunity to think and work outside the box. The innovative, five-day Summer Art and Architecture Camps for students K-12 that allows them to explore, create and design while embracing STEAM (science, technology, engineering, art, math) education and learning by doing, a key component to Wright&apos;s principles. The camps are held June 4 through August 3, and students can apply for scholarships. The Lost Lake Festival returns to Phoenix this year from October 19 to October 21. From the creators of Bonnaroo and Outside Lands music festivals, this will be the second year of Lost Lake, a three-day celebration of the Valley of the Sun’s vibrant culture through an eclectic blend of music, locally-driven culinary treats, interactive games and inspiring art experiences. More details will be announced in the coming months. Supercalifrailisticexpialidocious! Do we have your attention? Get ready for the “Practically Perfect” musical event of the summer at Herberger Theater Center – Mary Poppins The Broadway Musical. Watch the magic unfold onstage rom July 6 through July 22. Use promo code MPoppinsKids for early family buy one get one discounts. The Musical Instrument Museum Music Theater proudly announces its Summer 2018 Concert Series, includes more than fifty concerts through September, spanning multiple genres across the globe. Highlights this season include funk and soul legends Tower of Power, performing as part of their 50th Anniversary Tour; singer-songwriter Nellie McKayand, who has contributed music to a number of well-known movies; and ten-time Grammy Award winner Bobby McFerrin, who has successfully crossed over between genres of jazz, pop, and classical with his remarkable octave-jumping vocals. Tickets are on sale now. Check out the Summer of Spa specials at Joya Spa at Omni Scottsdale Resort & Spa at Montelucia, featuring a seasonal offer every day of the week. Summer deals include a 50-minute Classic Massage or Transformation Facial, complimentary fitness class, a 50 percent discount on a spa service with the purchase of an 80- or 50- minute spa service and more. Check the weekly schedule for discounted services and packages every day. Speed into the heat of the summer at the new Scottsdale Fahrenheit Festival: Arms, Legs and Kegs on June 16. The festival will feature the return of the Beat the Heat footrace across WestWorld of Scottsdale. The race will start at 2:47 p.m. sharp, the time of day in 1990 when thermometers in the Phoenix metropolitan area struck 122 degrees on June 26. The first place winner will receive $1,900 to commemorate the year Arizona broke this temperature record. As part of the festivities at the Scottsdale Fahrenheit Festival, participants can also watch the nation’s most lucrative arm wrestling contest featuring the World’s Greatest Arm Wrestler, Travis Bagent, as well as get cooled off by enjoying the best craft beers and cocktails. The Arizona Ales & Cocktails Festival located inside the Scottsdale Fahrenheit Festival will feature top mixologists, M Culinary and the Arizona Craft Brewers Guild. Are you ready for summer foodie specials? The newly transformed Phoenician is offering locals three chances to save. At Mowry + Cotton, guests can enjoy the Dinner Feast, a multi-course dinner, priced at $30 per person and the Weekend Brunch Party priced at $30 per person. Savor an assortment of fine teas, house-made finger sandwiches, scones and pastries at the Phoenician Afternoon Tea. Guests will enjoy tea and delicious bites at the Phoenician Tea Room and it is priced at $30. The Phoenician food and beverage specials are available through August 31. If the culinary combination of fried chicken and champagne wasn’t good enough, how about adding in some jazz too? That’s exactly what Fried & Fizzy, Arizona’s most innovative new food truck, has done. In addition to being able to book Fried & Fizzy for special event catering needs, the food truck now offers the option to book Doc Jones, a popular local jazz musician, to coincide with favorite food and drink indulgences. The agreement, announced today, appears to be a musical first for an Arizona food truck. A downtown Phoenix favorite, Angels Trumpet Ale House, is making its way to Arcadia. Housed inside a stylishly restored, revitalized mid-century modern space that was formerly a Sears Auto Center, Angels Trumpet Arcadia will also feature a craft cocktail lounge named Tall Glass. It is set to open in early August and guests will enjoy the same irresistible menu offered at the downtown Phoenix location. In addition to putting on a great game of baseball, the Diamondbacks are also environmentally conscious. The D-backs are one of 10 recipients of the Environmental Innovators of the Year awards, given to both individuals and organizations for their work in the sports greening movement. The Green Sports Alliance will present its Environmental Innovators of the Year award On June 26.